Lt. Neil M. Howison, U.S.N., arrived in the Columbia River 1 July, 1846 on board the 300-ton United States Naval Survey Schooner "Shark" for the purpose of making an investigation of part of the Oregon Country. His report was instrumental in creating public interest in the Oregon Territory and formulating a decision on the location of the boundary between English and American lands. The "Shark" was wrecked attempting to leave the Columbia on 10 September 1846. In an effort to get the ship off the spit, the three masts were chopped down and the cannon were jettisoned, but she began to break up and the crew took to her boats. 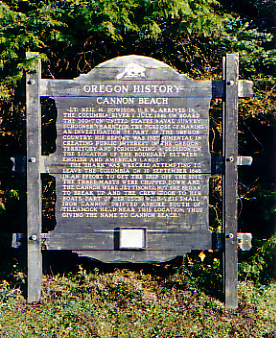 Part of her deck, with this small iron cannon, drifted ashore south of Tillamook Head near this location; thus giving the name to Cannon Beach.